Today a marriage proposal is all about the experience. Do you love kayaking or canoeing on Lake Meredith? Hiking in Palo Duro Canyon? Enjoying a glass of wine at Crush Wine Bar and Deli? Before you pick the place for your proposal you have to have the ring. In Amarillo, Texas the difference in finding your dream engagement ring or just an ordinary one is visiting our Coast Diamond Retailer of the Week, Barnes Jewelry. When starting your engagement ring shopping on Barnes Jewelry’s website you feel the welcome warmth and care in their words as they describe the honor they feel to be part of your special moments since 1956. Visiting Barnes Jewelry store you will experience the promise they give to their customers of making your engagement ring shopping experience fun and comfortable. One of the fun things Barnes Jewelry offers for your marriage proposal experience is the Ring Cam box to record the moment you propose. Click the banner below for more information on leasing the Ring Cam and to watch marriage proposal reactions from a video of Ring Cam proposals. What reaction do you want from your Ring Cam video as you propose with a Coast Diamond engagement ring? Bring her to tears of joy with this captivating Coast Diamond rose and white gold engagement ring (LC5447RG) with ribbons of pave set diamonds in the gallery and on the band of the ring. Take her breath away with this delicate round halo Coast Diamond engagement ring (LC5403) with petite diamonds cascading down the band. Make her jump for joy with this cushion shaped halo Coast Diamond engagement ring (LC10129). When you return your Ring Cam box to Barnes Jewelry you will receive a credit to purchase the gorgeous matching wedding band (WC10129). Congratulations to Barnes Jewelry for being chosen as Coast Diamond Retailer of the Week! A store highly decorated with five star reviews from its customers and full of stunning engagement rings beautifully paved in diamonds… That is Quest Fine Jewelry in Fairfax, VA. There are a few people in this world, okay maybe more than a few, that want to know that the places they shop, eat and frequent have plenty of five star reviews. From Yelp, to Wedding Wire, to The Knot, Quest has pages of five star reviews. “We had a wonderful experience… Pete is amazing… the best prices I could find when looking for an engagement ring” are just a few comments you will read over and over again. We couldn’t be more appreciative of the value, expertise and wonderful customer service Quest Fine Jewelry offers their customers, so Coast Diamond is excited to call Quest Fine Jewelry of Fairfax, VA our Retailer of the Week. What about the stunning engagement rings beautifully paved in diamonds? You will find Coast Diamond engagement rings “paved” in diamonds at Quest Fine Jewelry. For almost 40 years Coast Diamond has offered exquisitely designed engagement rings paved (or pavé as it is said in the diamond world) in diamonds. Pavé set diamonds give incredible sparkle at the very best value. This Coast Diamond platinum wedding set (LZ5001H-PT/Wz5001H-PT) is paved with graduated diamonds on the band of the engagement ring. Coast Diamond platinum engagement ring (LZ5001H-PT) with fishtail micro-pavé set diamonds on the band and a peek-a-boo diamond under the center stone. An engagement ring paired with this Coast Diamond wedding band (WC5181H) of 1/2 CT of micro-pave set diamonds makes the perfect wedding set. Coast Diamond fishtail micro-pavé set diamond band (WC5181H-PT) in platinum. Pave set diamonds in rose gold create an engagement ring of warmth and romance. Coast Diamond rose gold halo engagement ring (LC5340-rg) with pavé set diamond split band. 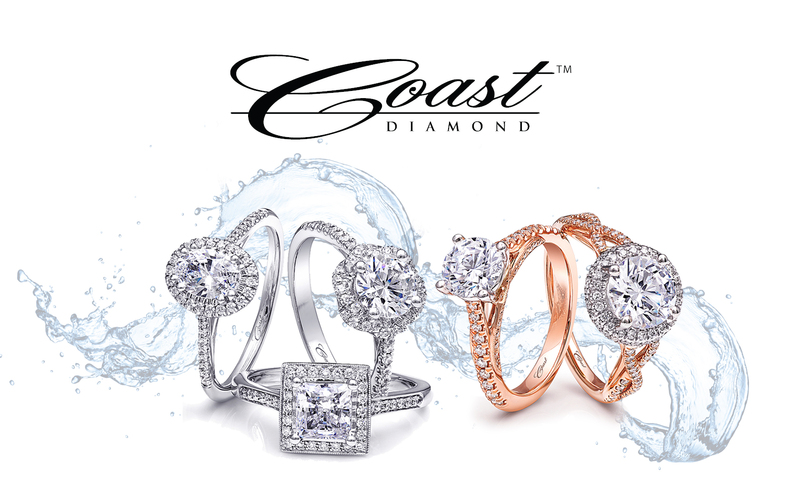 Congratulations to Quest Fine Jewelry of D.C. for being our Coast Diamond Retailer of the Week! What is typical in Cincinnati? Graeter’s Ice Cream – Cincinnati Reds – Skyline Chili – Your marriage proposal… Never! No matter how many proposals have happened since the dawn of time, when it’s yours… there is nothing typical about it. The place to find your engagement ring for your proposal in Cincinnati is The Richter and Phillips Company, because there is nothing typical about being in the fine jewelry business for 121 years. Richter and Phillips has the longest history in fine jewelry in Cincinnati and Coast Diamond is thrilled to call them our Retailer of the Week. There is nothing typical about your proposal and there is nothing typical about your engagement ring. The one carat, round diamond center stone is a very popular choice in size and shape for an engagement ring. By choosing one of these Coast Diamond one carat, round diamond engagement ring settings at Richter & Phillips you choose an engagement ring that is anything but typical. This Coast 1CT round diamond solitaire engagement ring (LC5237) is anything but typical with a peek-a-boo diamond under the center stone to add extra sparkle. This Coast 1CT round diamond, rose and white gold engagement ring (LC5447RG) is extraordinary with ribbons of pavé set diamonds on the band and in the gallery of the ring. The matching rose gold band (WC5447RG) completes this unique wedding set. The Coast 1CT round diamond halo engagement ring (LC5448) with a 0.69CT halo of bead set diamonds is not your typical halo engagement ring. It will stand the test of time. Cincinnati Reds, Graeter’s Ice Cream and Skyline Chili fans… Don’t settle for anything typical when it comes to your engagement ring. The Coast Diamond one carat, round diamond engagement ring you’ve been dreaming of is waiting for you at Richter & Phillips. Congratulations to The Richter & Phillips Company of Cincinnati for being our Coast Diamond Retailer of the Week! Attention Los Angeles, CA residents! Robbins Brothers The Engagement Ring Store in Fullerton is hosting a Designer Event which will feature Coast Diamond! Stop by the store on either Saturday, April 21 or Sunday, April, 22 to take advantage of special in-store promotions that include Coast Diamond engagement rings and diamond jewelry! Where do you begin to choose an engagement ring? If you are like most couples today you start online. We would like to suggest you visit the D. Geller & Son newly redesigned website where they have a wonderful new tool that allows you to design the engagement ring of your dreams online. You can start by choosing the style of engagement ring: solitaire, three-stone, halo or antique… Then, choose the shape of the center stone you desire… On to the precious metal type… And finally the price range of the setting. You can also browse their incredible selection of diamond center stones. This tool on the D. Geller & Son website is a fun and informative way start your engagement ring shopping. D. Geller & Son in Georgia has a great pulse on how today’s couples shop for engagement rings and for this Coast Diamond is honoring them as our Retailer of the Week once again. What is the most important feature of the engagement ring of your dreams? The Size of the Center Stone? Start at D. Geller & Son by picking the perfect center stone. If it is a 2 CT round diamond, this elegant and dazzling Coast Diamond halo engagement ring (LZ0245A) with diamonds running down the shoulder of the band is the ring for you. The Style of the Setting? Start at D. Geller & Son by choosing the style of setting you desire. This Coast Diamond cushion shaped halo engagement ring setting (LC5256) is a classic choice for a bride who loves the halo design. Start at D. Geller & Son by choosing the metal(s) you desire in your engagement ring setting. Today couples show their individuality by the choice of precious metal or combination of precious metals they select for their engagement ring. This Coast Diamond solitaire engagement ring (LC5219), shown in platinum, is available in white, yellow, or rose gold as well. For a modern twist, we’ve added a surprise diamond at the side of the center stone. Congratulations to D. Geller & Son for being our Coast Diamond Retailer of the Week!